It’s worth saying something about the abstract loveliness of Scholefield’s work generally, as he has quickly built a distinctive visual language for himself. It’s entirely organic, and handmade in his digital works. Prints by Konx-om-pax, for Warp Records. There’s a raw, naive quality to Sholefield’s visual imagination, one that pulls back elements to the most striking beams and splotches of colored three-dimensional forms. I was back and forth on the faux film-grain in the Laurel Halo trailer, but I’ve grown to love it after repeated viewings; it brings an awareness of the surreal hallucinations in 80s and 90s movieplex trailers – you know, the ones with the jazzy music that come on and remind you to be quiet and considerate and use the fire exits before the film comes on. But amidst all these infusions of colored liquid and sparse geometric forms oozing and interrupting planes, there’s always a sense of graphic order and cohesion. And the fact that it’s sometimes wrapped in the kind of gauzy, retro-cool filters that the musical artists favor somehow doesn’t dilute the impact of that. Seeing this in a live musical show should be a real treat. Have a look at some of the highlights of those other collaborations – and keep watching, as we eagerly await what’s next to come out of this Glasgow artist’s head. Hudson Mohawke – Joy Fantastic (Warp Records) from Konx-om-Pax on Vimeo. Martyn – Viper (Brainfeeder) from Konx-om-Pax on Vimeo. Konx-om-Pax – Reel 2012 from Konx-om-Pax on Vimeo. 12.10.2012 Skanu mezs festival, Riga, Lativia. 13.10.2012 Kuudes Linja, helsinki, Finland. 14.10.2012 Golden Pudel, Hamburg, Germany. 20.10.2012 Hackney Empire, London, UK. 27.10.2012 Sneaky Petes, Edinburgh, UK. 30.10.2012 Bad Bonn, Düdingen, Switzerland. 04.11.2012 Nave de Musica, Matadero, Madrid, Spain. 08.11.2012 Circolo degli Artisti, Rome, Italy. 21.11.2012 Plastic People, London, UK. 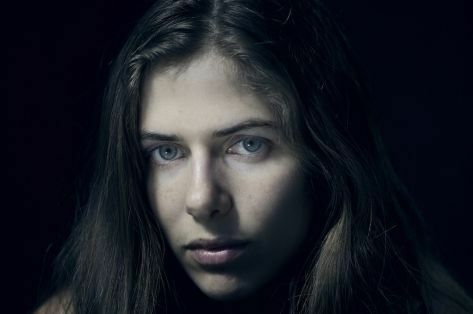 Laurel Halo. Photo: Tim Saccenti.